legal advisor. Graduated in Law and Administration from Warsaw University in 1997. Admitted to the Bar in 2003. 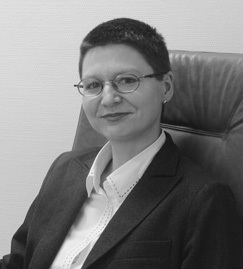 Worked for Bogumiła Kowalska’s Legal Office from 1995 until 2001. From December 2001 until November 2006 worked for Forystek & Partners Advocates and Legal Advisors, from January 2004 until November 2006 as a Partner. From December 2006 until March 2008 worked for Legal Office J. Chalas and Partners. She has been a partner in the Law Firm since April 2008. Agnieszka provides legal consulting services with a special emphasis on legal assistance for entrepreneurs. She specializes in broadly considered commercial law, in particular corporate law, real estate law and labour law. She advises Clients in financing real estate, preparing loan documentation and all collateral documents as well as other documents related to project finance. Agnieszka has a great deal of experience in conducting legal proceedings, both civil (commercial, labour courts) and administrative.